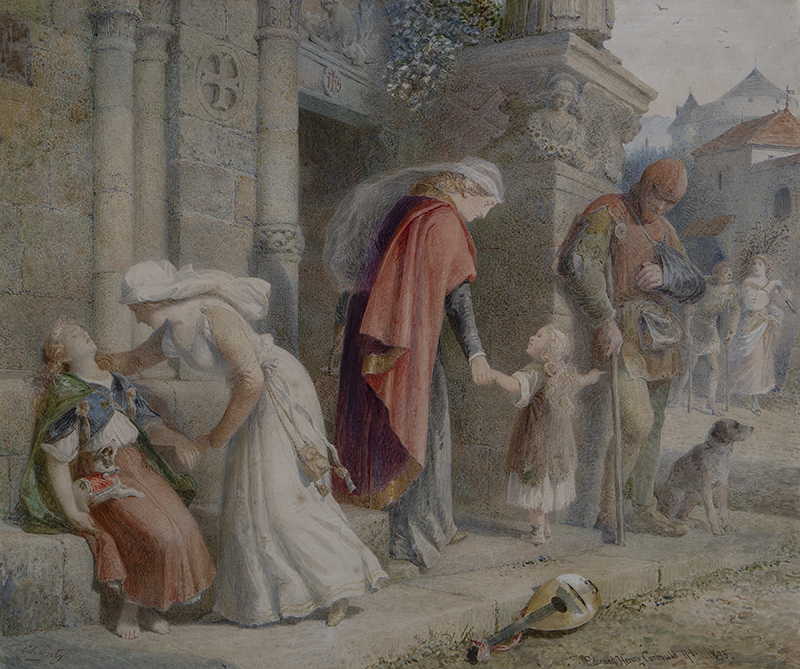 Edward Henry Corbould (British, 1815-1905) “Charity”, Figures by a Church Door, Watercolor, Signed, Inscribed and Dated 1895, 17.75″ x 21″. Born in London, he was son of Henry Corbould and grandson of Richard Corbould, both painters. He was a pupil of Henry Sass, and a student at the Royal Academy. In 1842 his watercolor of The Woman taken in Adultery was purchased by Albert, Prince Consort, and nine years later he was appointed instructor of historical painting to the Royal Family. He continued for twenty-one years teaching its members. Corbould died at Kensington on 18 January 1905. He has a memorial tablet in St Mary Abbots church in Kensington, London. His grandson was the noted designer Leonard Wyburd.